Dil Aara’s first episode was disturbing, extremely emotional and engaging. This first episode immediately grabbed my attention and I felt an instant connection with the characters. Dil Aara’s troubles, her happy moments, her relationship with her family members and the tension in Nawab Salahuddin’s (Abid Ali) mansion was translated on screen superbly. This drama serial has been written by an ace writer who recently gave us one of the most powerful plays of recent times – Dar Si Jati Hei Sila and it has been directed by one of the most talented directors in the drama industry. The performances in this first episode were beyond remarkable therefore I have huge expectations from this drama. The overall feel of this first episode was melancholic. The meaningful and sad background score went well with everything which was being shown. This episode covered present day as well as the back story which made it even more interesting. Such beginnings are always more intriguing since the viewers are more eager to find out how the main protagonist landed in the situation he or she is today. All the scenes were written and executed beautifully. Dil Aara’s (Kinza Razzaq) relationship with her father (Muhammad Ahmed) was established so beautifully in this episode because of which his exit from the story had a powerful impact. It isn’t easy to establish such a connection in a short time frame but the writer, the director and the actors involved did their job so well that it felt like you knew these people for the longest time. While Dil Aara’s father was willing to do whatever it took to make his daughter happy, her mother (Samina Ahmed) did not think that investing so much money into her marriage and satisfying the greed of Mohsin’s (Umer Naru) mother was an intelligent thing to do. So far, it looks like Dil Aara’s mother was not entirely looking out for her daughter but perhaps was looking out for her own self and her other daughter too just as much. Mohsin and Dil Aara’s scenes were shot beautifully and were in stark contrast to the wedding which was being held in the present-day. 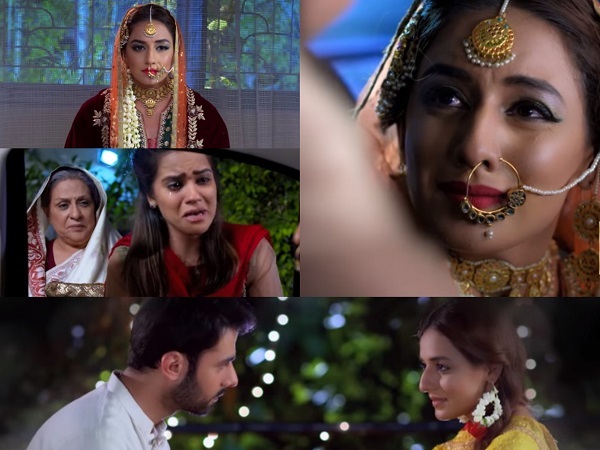 Dil Aara was full of life, she was carefree and hopeful for the future when she was getting married to Mohsin but now this marriage was like a heavy burden which she was probably carrying because of her mother. The environment in Nawab Salahuddin’s mansion was also captured brilliantly. There was a suffocation in this place, the way Khanum kept a watch on Dil Aara and her dialogues clearly showed that she was the one in control. The cold look on Kinza Razzaq’s face and her body language went perfectly with the situation she was in. I absolutely loved the scenes covering Dil Aara’s relationship with her sister. This first episode piqued my curiosity because so many questions were left unanswered. Why did Mohsin disappear all of a sudden? Mohsin seemed genuinely in love with Dil Aara so why did he leave her at a time when she needed him the most? Was he also greedy like his mother? Why did Dil Aara agree to this marriage? I definitely want to know more about Khanum and Nawab Salahuddin too. Everything about this first episode was picture perfect. The overall feel of Dil Aara’s first episode was mysterious as well as unsettling. The performances were superb and the execution couldn’t have been better. The production values were impressive too. I do feel however that Kinza Razzaq’s make-up could have been better. Every scene was beautifully written and directed. The OST of this play is haunting and it was used effectively throughout. Bee Gul’s plays are always heavy-duty but at the same time they keep you coming back for more. This first episode reminded me of Bunty I Love You. I was completely sold after watching this first episode and can’t wait to tune into the next one. Did you watch the first episode of Dil Aara? Do share your thoughts about it.